Download Brochure Download Form to Mail Join Online Now! Your Lee’s Summit Symphony has garnered attention as a first-rate symphony orchestra since its inception in 2003. LS Symphony has enhanced the cultural landscape of Lee’s Summit and its surrounding communities. As we begin this new chapter in the Symphony’s rich history, we look to our support system of business sponsors, donors and community to help propel us forward with our mission. The mission of the Lee’s Summit Symphony Orchestra is to provide excellent musical experiences that enhance the quality of life for the community. 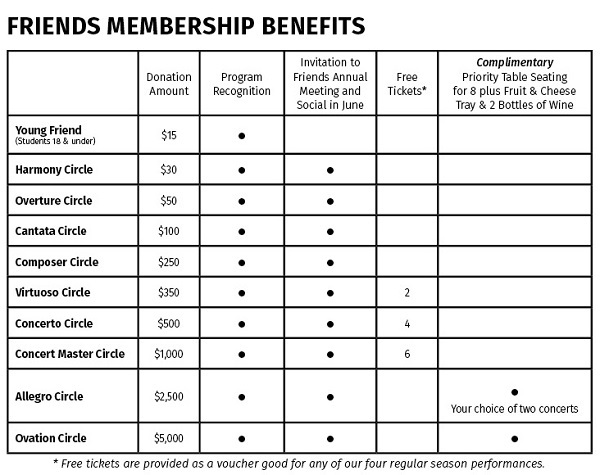 WHY BECOME A FRIEND OF THE LS SYMPHONY? helps support operations, and provides youth and adult education activities. In addition, you help enrich the quality of life in Lee’s Summit and play an important role in our community’s economic development. Friends of the Lee’s Summit Symphony enjoy recognition in our concert programs and on the website and receive an invitation to the Friends’ annual meeting and social. Membership starts at only $30 per year. Businesses may join for as little as $100 as a Business Sponsor (visit our Sponsor Page for more information). Students 18 and under may join for $15 as a Young Friend of the Symphony. Questions? Please call the office at (816) 401-5251. Thank you for your support of the Lee’s Summit Symphony! Purchase tickets for any upcoming performance. Make a donation to the LS Symphony. Sign up for updates from the LS Symphony!